This fabulous dessert combines two summertime favourite desserts - strawberry shortcake and creamy cheesecake. Remove rim from 9-inch springform pan; set aside. Place bottom of pan on shortcake; use as pattern to trim shortcake to fit inside springform pan. Reserve cake trimmings for snacking or another use. Reassemble springform pan. Place cake in pan; brush with jam. Beat cream cheese, sugar and vanilla in large bowl with mixer until well blended. Add eggs, 1 at a time, mixing on low speed after each just until blended. Pour over cake. Bake 35 to 40 min. or until centre is almost set. Run knife around rim of pan to loosen cake; cool before removing rim. Refrigerate 4 hours. Spread cheesecake with Cool Whip just before serving; top with berries. Cut up cake trimmings; store in airtight container at room temperature. 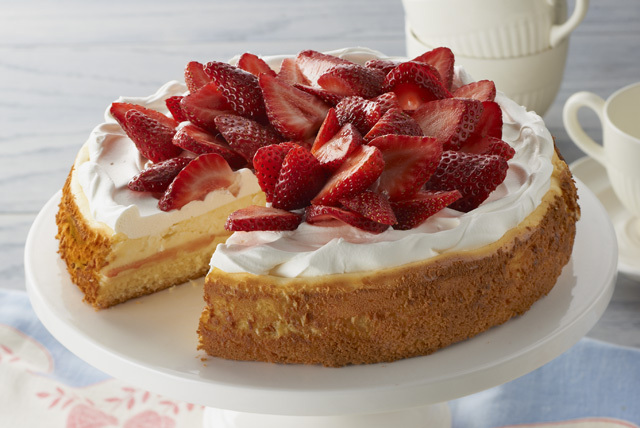 Serve topped with additional sliced strawberries and thawed Cool Whip for a quick dessert or snack. Savour a serving of this crowd-pleasing dessert on special occasions.